Score high on eco-friendly, and achieve better health. Our article earlier in January focused on how we can reduce our plastic consumption. 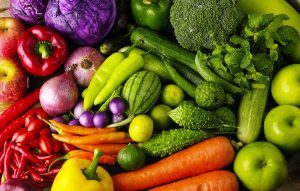 This article takes that intent further, and focuses on our food related shopping, and how we can make it more planet friendly. Why food? Consider this: We all eat 3 times a day. With a global population of 7 billion (700 Crores), food is the single largest purchase we human beings make. If we can make even the slightest shift to a more sustainable option in our food, the payoffs are huge. The American writer Margaret Mead once said: “Never doubt that a small group of thoughtful, committed citizens can change the world; indeed, it’s the only thing that ever has.”. This idea is most appropriate in the context of each one of us choosing what we buy for our families. We have a few suggestions that you can try out for your groceries/food shopping. As you read through them, you will find that not only are they more eco-friendly, they are undoubtedly healthier. Which goes to prove that what is good for the planet, is good for us (and vice versa). The agrichemicals industry has a huge environmental footprint, and we don’t need it at all. Organic farming also nourishes and preserves soil fertility, which is why organic farms produce regular yields year after year, whereas conventional farms need increasing inputs each year as their fertility reduces. The added benefit is that organic food is loaded with nutrients and bereft of harmful chemicals. This means our own long-term health improves with consuming organic food. Read the 2013 UN report that categorically explains how small-scale organic farming is the only sustainable way to feed the world. Consuming dairy, eggs and meat is inherent in many cultures. However, consumption of animal based foods is inherently inefficient from the point of resources. This issue is multiplied many folds in today’s food system, also called factory farming. Huge amounts of food are grown to feed cattle, hens, pigs and lamb. This food if grown for direct human consumption would require much less quantity. Creating 1000 calories of food for humans from animals is much more draining on resources such as water and land, as compared to producing the exact same amount from plants. All this food (except for organic meat) is again grown with the use of fertilisers and pesticides. In the USA (and then exported to other countries), animal food is predominantly genetically modified corn and soy. To increase the efficiency of the factory, animals are kept in tightly packed lots, thus resulting in unsanitary conditions, and animals falling really sick. The industry addresses this by pumping them indiscriminately with antibiotics. (In the US alone 80% of antibiotics manufactured is used for livestock. India has no regulation on how much antibiotics can be given to animals). And we end up consuming food that was sick and full of antibiotics. To increase the quality of the meat (i.e. to quickly grow muscle, to increase milk output etc. ), the animals are fed growth hormones on a consistent basis, which ends up in our bodies when we consume them. Look for meat and dairy that isn’t from a factory (your local butcher, a small vendor of eggs from free grazing chickens). If you cannot eliminate meat, or find good quality non mass produced meat, remember: even trimming it down to a couple of meals per week will go a long way. Not just on the impact on the environment, but also on your health. And don’t worry about the protein and calcium. Eating a good mixture of fruits, nuts, vegetables and whole grains (like brown rice, whole wheat aata and unpolished millets) delivers all the nutrition that our bodies need. 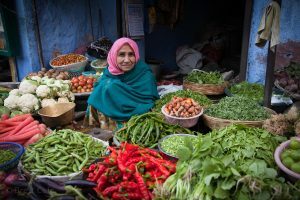 Beautiful vegetable market stall in Jodhpur, Rajasthan, India. PC: Bret Cole. The more distance food has to travel to your house, the more “food miles” it has. Choose foods that have fewer miles than more. When you buy food that was grown/manufactured far away, it requires energy to store, and transport to get to your home. If it is refrigerated/frozen food, even more. Buy perishables such as fruits and vegetables in your local mandi. Why not the supermarket? 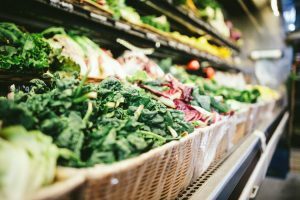 A supermarket may look hygienic and clean, but vegetables there are invariably bought ahead of time and stored in refrigerated units. This means your local mandi not only avoids the refrigeration footprint, but also assures you fresh products. Local produce also helps build more resilient and decentralized supply systems, from the farmer to the market. You also indirectly cut down on the packaging footprint also because these products now do not have to be packaged to travel and survive long distances. Another advantage to buying local food is that you are supporting local biodiversity. You will end up buying produce that is grown because it is well suited to the local climate. E.g. : Buying Sesame, Safflower or Groundnut Oil in south India is a breeze because they are very hardy and suited to the climate. The Safflower plant requires virtually no water, and grows all over the arid Deccan plateau. To explain why its better to buy in season, lets first look at what is sub-optimal about buying out of season. Say you want to eat an Apple in Mumbai in June. The apple harvest in Kashmir happens September/October. To satisfy a year-long supply, apples are kept in cold storage. The apple you are eating in June, has been sitting inside a refrigerated unit for 8 months !!! Would you be able to enjoy its taste? What about its nutrition? And imagine having to waste all that electricity to run the refrigeration unit for 8 months. Eating seasonal food gives us the benefit of maximum freshness and nutrition, and minimizes having to store it year-long. However, for grains like wheat, rice and millets, these are harvested only once a year, and need some storage that will keep them safe from pests. If we reduce our consumption of grains and increase our intake of seasonal fresh fruits, vegetables and nuts, we will improve our health, as well as reduce our own carbon footprint. Nature stores whole food in safe containers: the husk of the grain, the skin/peel of the fruit or vegetable, the kernel of the nut. Eating food that comes directly out of these natural containers has the most nutritional value. Processed foods are stored in man-made containers: polythene, tin can, glass bottle, tetra pack… the list goes on. It takes an immense manufacturing industry (read resources of energy, water, land, and leftover polluted air/land/water) to package the food in these containers and ship them to you. The biggest consideration for any manufacturer while packaging a product, is its shelf life. The longer the shelf life, the greater the chance that the product will be purchased before its expiry date. To summarise, an eco-friendly shopping list, is foremost a healthy shopping list. And the 5 suggestions above roll into one simple maxim: Choose local, seasonal, whole, plant-based food. Makar Sankranti is one of India’s most popular harvest festivals. Farmers all over India wait till the months of January-February to harvest their crop and express gratitude to god for the year’s harvest. The name, “Makar Sankranti” is loosely translated to mean “Capricorn Transition”. Thus, Makar Sankranti is celebrated on the day the sun reaches its southernmost dip and then starts moving northwards. 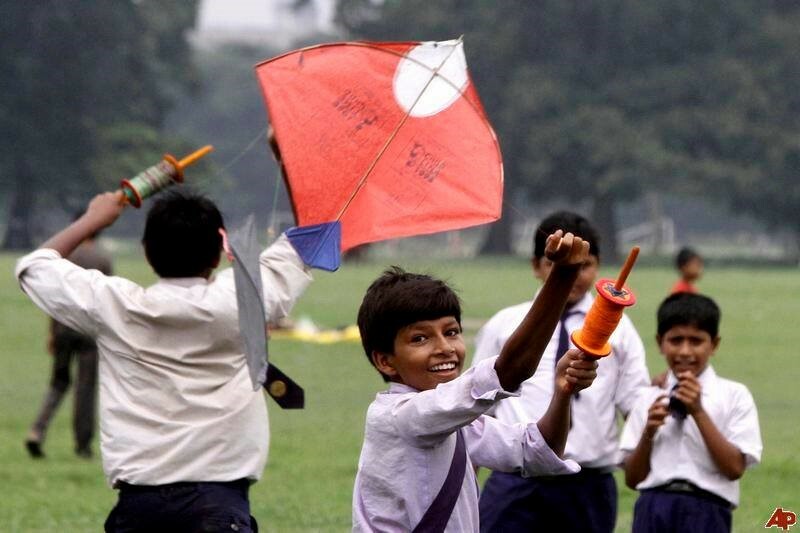 Makar Sankranti is celebrated all over India, and each region has its own unique celebration. For example, the world’s largest gathering of people, the Kumbh Mela, organized in Allahabad (now Prayagraj) is inaugurated with the first dip on Makar Sankranti. Here’s a good photo album on Kumbh Mela. Punjab celebrates Sankranti as “Maghi”. Taking an early morning dip in the river is considered an essential part of the Maghi celebrations. The Hindus light Diyas or lamps with sesame seed oil, as it is known to invite prosperity and drive away all sin. Since Maghi is celebrated during peak winter seasons, the food eaten is very rich and high in calories. Slow-cooked Kheer, Khichdi, Jaggery, etc. are main components of the menu during Maghi celebrations. “Sankrant” is a big deal in Rajasthan and MP. Sankrant holds a lot of cultural significance in this region and is the main festival of the year. A part of the traditional celebrations is to gift 13 married woman any household item. A married woman’s first Sankrant has much value – she is invited to her maternal home along with her husband for a huge feast. Sweets such as Til-Gud Laddu (Sesame-Jaggery Laddu) are prepared and distributed among family and friends. Kite-flying is considered a part of the tradition in this region. The sky is filled with colorful kites, with people of all ages engaging in kite-cutting contests. Sankranti is celebrated as “Pongal” in Tamil Nadu. It is celebrated across four days, with each day dedicated to a different god associated with agriculture. The first day is celebrated as Bhogi wherein farmers express their gratitude to Lord Indra. The other three days are Thai Pongal, Maattu Pongal and Kaanum Pongal. Pongal is a delicacy prepared as Prasadam for the deities. It is incredibly simple to make and takes about 30 minutes. On Pongal day, women of each neighborhood come out and cook pongal on the streets, marking a celebration of hope, abundance, and sharing. 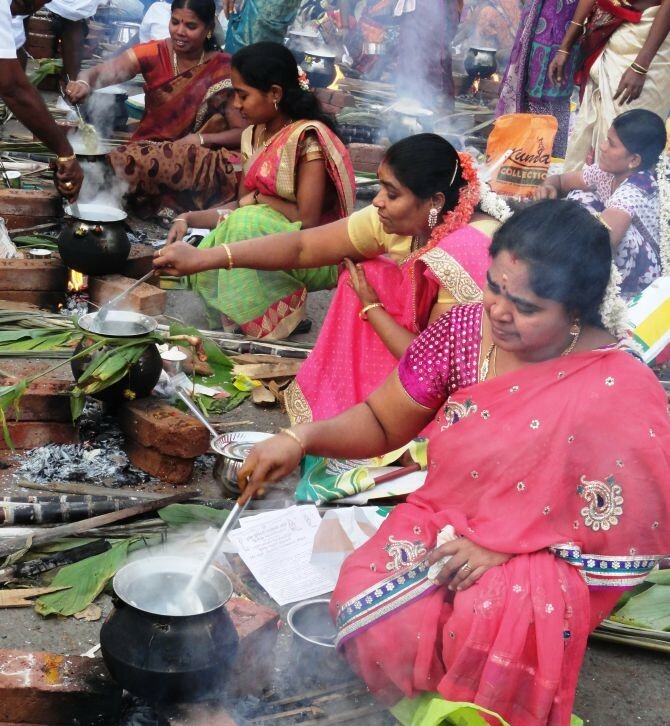 Women participating in a community pongal-cooking celebration in Dharavi, Mumbai. Odisha celebrates Sankranti with much enthusiasm and faith. Deities are offered Prasadam prepared using uncooked newly harvested rice, jaggery, coconut, banana, sesame, rasagola, etc. Apart from this, devotees at the Konark temple pray with much intensity as the sun starts its northward swing. Apart from the usual traditions, there are also a few unique traditions here. For example, people reaffirm their friendship with their best friends during Sankranti. 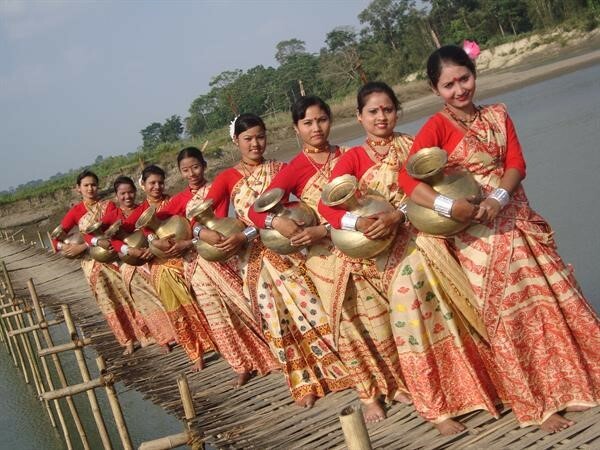 Assam celebrates Bihu which signifies the end of the harvesting season for the year. The festivities of Bihu last up to a week and are adorned by bonfires and colorful Rangolis drawn everywhere. Traditionally, the youth build huts made out of bamboo, leaves, etc., and then feast in those huts. Then, the next morning those huts would be burnt. Gujarat sees a lot of vibrance for Sankranti. It is celebrated for two days in this region with the first day being called “Uttarayan”. 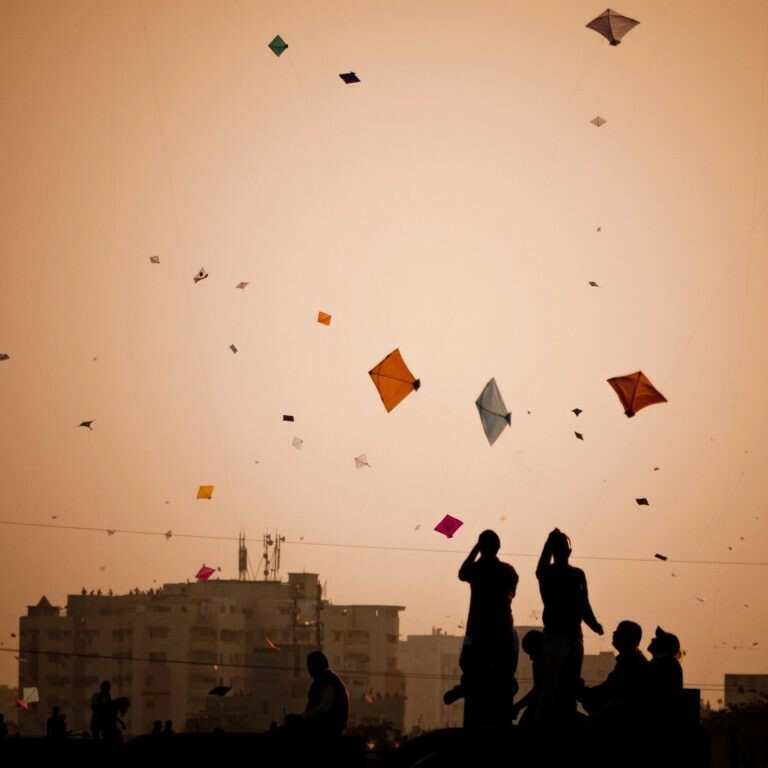 Skies in major cities are filled with kites of various sizes and shapes. 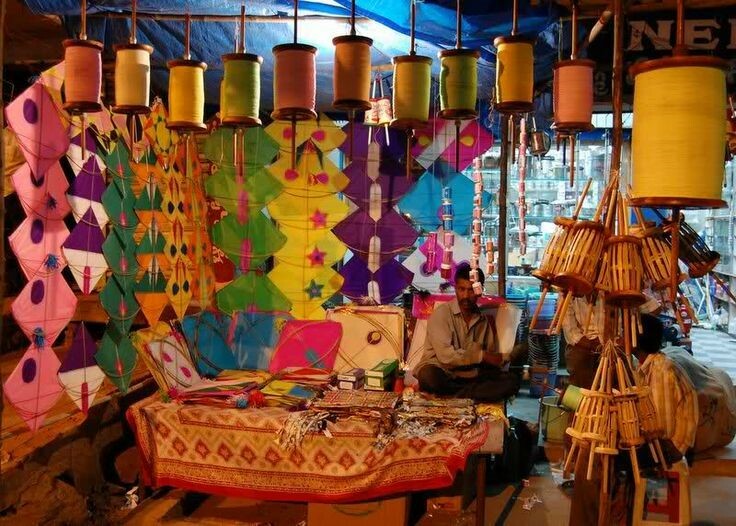 There is a fierce kite cutting competition, and the cord used to fly kites is usually strengthened. Winters in Gujarat are cold as well, which means that a lot of cold weather food is prepared during Sankranti, ranging from simple snacks like Chikki, to complicated dishes like Undhiyu. Makar Sankranti is celebrated in Maharashtra for two days. There is a lot of emphasis on community, hence Maharashtrians distribute Til-Gul Laddus, and wish for the other person to utter only sweet words for the year. Apart from these laddus, Maharashtrians also prepare another delicacy called Puran Poli. 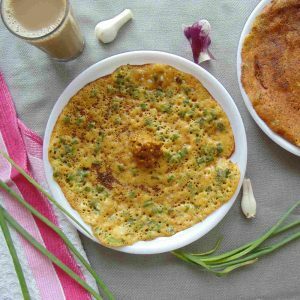 You can try the recipe for Puran Poli here. This region views Sankranti as one of the main festivals of the year. Married women are visited by one of their brothers who brings a gift of warm clothing for her family. She offers sweets to her brother, such as Churma. For farmers in Karnataka, January-February bring about Suggi, which is the harvest festival celebrated here. In a ritual called Elle Burodhi, girls wear new clothes and visit the homes of friends, family and neighbors with an offering of a small plate of Sankranti offerings. The plate generally consists of white sesame seeds mixed with fried groundnuts, dry coconut and fine cut jaggery. 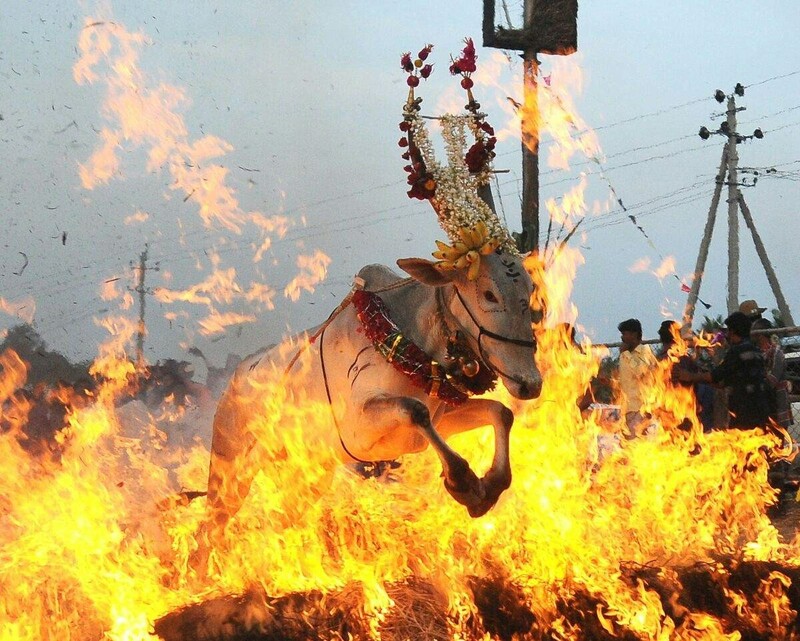 Among other rituals such as kite flying, one of the most important rituals involves the display of cows and bulls in colorful attire in open fields. The cows are dressed up for the occasion and are taken out for a procession. They are also made to jump over an open fire. This is quite common among farmer communities in rural Karnataka. India’s little neighbor celebrates Sankranti as Maaghe Sankranti. Celebrations involve lots of pomp and show, along with a ton of food cooked as offerings to deities distributed among friends and family. Here’s a very good blog on an authentic Maaghe Sanranti experience in Nepal. Do add comments about your own cultural practices of celebrating Pongal/Sankranti/Lohri/Bihu. Daana, and all our farmers wish you a very happy Makar Sankranti! India has always held Christmas in high regard. Though the population of Christians is just around 2.5% of the total population, India has around 30 million Christians distributed over various states and territories. Goa has a Christian population of around 25%, which makes Christmas in Goa a sight to behold. It is a known fact that Goans love to celebrate Christmas with much fervour. People participate in midnight masses and gorge on traditional curries and Christmas pies. People also decorate and maintain traditional Christmas trees which helps in bringing the spirit of Christmas alive. Goans prepare a traditional delicacy, called “Neureos”, which you could try at home today! Let’s go from the Westernmost corner of India to the Easternmost corner. India’s North East also has a very high concentration of Christians who take pride in celebrating Christmas with much enthusiasm. In the Northeast, tribal Christians celebrate their Christmas week by going out every night, singing their traditional Christmas carols and telling the villagers the story of Christmas. The whole state is beautifully lit to welcome the arrival of their dear Santa Claus, and the air is alive with singing and merriment. In Kerala, Christmas is an important festival, for about 20-23% of the population is Christian. The huge churches of Cochin are majestically decorated to get the town in the spirit of Christmas – not that it is required, though. Keralites hold Christmas close to their hearts, as is evident by their exalted celebrations. Syrian Catholics are known to fast from the 1st to the 24th of December, and will break their fast only on the Christmas Eve Midnight Mass. The midnight mass sees an atmosphere of exuberance and excitement – Christmas is finally here. Keralites take their Christmas food just as seriously as the festival itself. Here’s one of our favorites, Lemon-Garlic Herbs Grilled Chicken. When talking about Christmas, one cannot ignore the decorous spirit of Mumbai in celebrating this festival. Mumbai’s public places are awash with Christmas lights and stores usually have a small Christmas tree up front. Christmas in Mumbai is much like Christmas in Australia – neither is it cold, nor is there any snow. However, Mumbaikars celebrate Christmas with lots of enthusiasm. Here’s a list of a few Midnight Masses in Mumbai that you shouldn’t miss out on. India has a small number of Christian farmers. Most of them are marginal farmers who can barely make ends meet. However, this doesn’t stop most of them from getting into the spirit of Christmas. Sometimes, instead of a traditional Christmas tree, some people decorate Banyan or Mango trees, the reason being that they’re easily found and are significantly cheaper. For most Christian farmers, Christmas celebrations are all about affordability. Some will also use mango leaves to decorate their homes. ‘Fair trade’ in agriculture simply means that the farmer gets sufficient monetary compensation for their efforts, rather than money being skimped off by middlemen and other intermediaries. Free trade involves a lot of local sourcing connections and can be difficult to establish in a system so fixated on middlemen. It is a known fact that farmers are exploited six ways to Sunday by middlemen at every opportunity they get – and the opportunities are plenty. The result is that the farmer doesn’t get a fair compensation for all their hard work in tending to their crops. Christmas is all about kindness and looking out for those around you. Farmers form a pretty significant part of our lives. Paying the farmers a fair price will only strengthen their resolve, helping you make their Christmas better. Fair trade not only ensures the farmer a fair monetary compensation for their efforts, but also the respect that they so rightfully deserve. What can you do to help farmers? For one, you could either start purchasing directly from local farmers without the added burden of middlemen, or buy from an organization that works closely with farmers to help these farmers make some money. A lot of people host Christmas parties. The food you serve can be organic. Choose seasonal, organically grown vegetables to go into your menu as the bare minimum you can do to go organic. Cotton is regarded as one of the most polluting industries. Organic cotton, on the other hand is grown using sustainable farming practices. Indians use cotton for two purposes during Christmas – decorations and gifts. Not all regions of India are blessed with snow during Christmas, resulting in widespread use of cotton to create the effect. The other use of cotton occurs in the form of gifts – a lot of people gift other people clothes during Christmas. Swapping for organically grown cotton will help reduce your carbon footprint, and help you go organic. This Christmas, ditch the supermarkets for your food-based needs. Identify your local farmers, locate their farms and try to spend at least a little time with them. This serves two purposes – one, you get to know the farmer and their hardships, and two, you get to help them by buying their produce directly. Christmas has always been a big deal in India. Over the past few years, it has started gaining more popularity in terms of celebrations. You don’t necessarily have to be Christian to get into the Christmas spirit. It is rightfully said that Christmas isn’t just a festival – it’s a feeling. Get into the Christmas spirit, take time off to be with your family and friends. Daana wishes its customers a Merry Christmas, and a Happy New Year. Dussera got over last week after a glorious Navaratri celebration all over the country. Navaratri in Tamil households involves lots of preparation from arranging and decorating the Golu to making prasadams (bhog) every single day – twice daily. We make lots of Sundals (which is a dry salted salad-type preparation with different lentils) as prasadam. People also make different sweets to induce some variety to the prasadams. This time I tried Sitaphal (Custard Apple) Kheer as part of my prasadam. This is the season for custard apples and I got quite tempted to try out this recipe. It turned out to be pretty good and I am sure people who relish kheer would love this one. Boil milk in a large pan/bowl. After the first boil, add sugar and stir it occasionally till the milk starts reducing. Extract the pulp from all the custard apples by removing the seeds-its quite a task..:). Grind the pulp to a smooth paste and keep it aside. 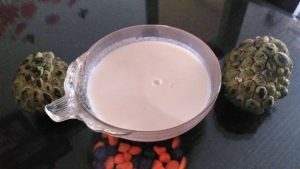 Once the milk reduces to half its quantity, it will turn light pink in colour. Turn off the gas, add the fruit pulp and stir well. Finally you can garnish it with almonds, pistachios, cashews and raisins, roasted in ghee. This kheer tastes great when served chilled. Now that fresh custard apples are available in abundance during this season, this recipe is definitely worth a try!! Our favourite fruit, Mango, will fast dwindle away in the next 2 weeks with the summer passing and the arrival of Monsoon. Many sweets, salads and dals are made out of different varieties of Mangoes. 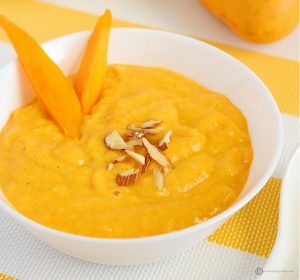 The Mango Kheer is a unique dish which tastes excellent, especially when served chilled. Let’s take a look at this easy recipe. Boil the milk on medium flame. Add sugar. After adding sugar when the milk starts boiling, add the raw rice. Let the rice cook in the milk. Keep stirring till the milk starts reducing. It will turn to a very light pink colour. Turn off the gas and cool it to room temperature. 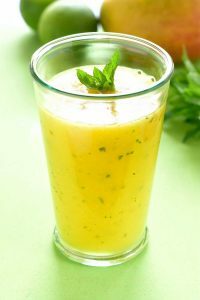 Blend the mango pulp into a smooth puree. Add this to the cooled milk and mix well. This recipe turns out to be mildly sweet. You can adjust sugar according to your taste even at the end. Garnish with a few almonds, cashews and raisins roasted in ghee. Serve this kheer chilled. Enjoy the Mango Kheer before the season of Mangoes end! Summer is here in full swing and you can see people gathering at Lemon Juice stalls, Coconut water and Cucumber stalls to quench their thirst and also cool their bodies. It is very important to keep ourselves hydrated in order to avoid heat strokes. Aam Panna is one such cooler which helps in hydrating and also cooling our body. Peel the raw mangoes and slice them into small pieces. Cook the slices in 3 cups of water. When the mango slices become soft, add the jaggery and switch off the flame after 2 minutes. The jaggery will dissolve in the hot mango solution. Now add rock salt, roasted cumin seeds powder and the mint leaves. Cool it by refrigeration. Add water and ice before serving. You can also add cardamom for flavour. Here is a simple question: If farmers produce food and food is a basic necessity, why are they not getting a fair price for their produce? Therein lies a conundrum. Those who produce the most basic things needed for our lives: food, shelter and clothing are the ones that have the worst lives in our country. Sure, we can be ashamed, we can beat ourselves up, or we can, as CM Fadnavis did, form a six man committee to ‘study the problem’. Let’s first understand the extent of the challenges in the a few posts and then bring the possible solutions to these in the following posts. Bear with me when I take no pleasure to say ‘it is complicated’. If you plan to get onto the farmers’ case saying they cannot be bailed out all the time, I would suggest you get off this blog and read about tax holidays, land and money that our government and financial institutions have poured into the hands of beacons of capitalism. Start from the techies and proceed towards the diamantaires. We will keep those rants and woes for another place and time. A farmer needs water and seeds to begin with. Push the seed into the soil, water it and watch it grow. In six months, harvest it and sell it at the market. Go home and have a great holi. Life looks simple from the outside. But we have already dropped too many words. Water, Seeds, Soil, Market. That’s what a farmer needs to grow. We’ll just talk about water in this post. There is no water. We are running out of it. Each of us needs 100 litres of water a day. That is 125 billion litres of water a day for 1.2 billion people in India. To give you an idea of what that is, a litre is held in a cube of 10 cms to a side. A billion litres will need a tank that is about five kilometers high, five kilometers wide and five kilometers long. 125 billion litres is just one day’s water. That’s bheja fry for sure. You protest and say, I barely drink a litre and bathe in another 10 litres, that makes it 11 litres. Did you forget to tinkle after you sprinkle? Each toilet flush releases 20 litres of water, go and calculate. Then add the water that your dishes take to get washed, your laundry, cooking, gardening, car wash.. I suppose you get the picture. Probably, even the 100 litre figure is quite conservative for us, the urban middle class. And remember: electricity needs water, every material we use on a daily basis needs water as a basic commodity in its manufacturing. What’s worse is that we haven’t yet counted water required for farming and for industry. So, here goes : 1 Kg of rice can and usually does take 1200 litres of water to produce. Meat requires even higher amounts of water. It would be mind boggling to imagine the shape of a water tank that is needed to grow all the rice that the country needs. Even worse. Our current ways of chemically dependent farming need far far more water than organic farming needs. In a nutshell, we are more mouths to feed than before, we are eating more water intensive foods than before and we are growing them in ways that need more water than before. It is a perfect storm. Have you heard of water farmers? No, silly, not the ones who grow food with the help of water. Water farmers are folks who decided that as water is the most precious input into farming, it makes sense to just sell their water off. Tankers come in, fill up water from their bore-wells and head to the cities to fill up the sump tanks of apartments and bungalows. Water is becoming more expensive than grains. How has that come to pass? We can all hazard a guess. My guess is that many of us are willing to pay the price for more water. We are the most water consuming society that ever lived.. and we live in times of the greatest water scarcity ever. So, when we need so much water, given that rains are erratic and they are bound to get even more erratic in the future, the only way to get more water is to draw it out from the earth. Dig a well, drain the water out. The well goes dry, dig deeper, keep going. The deeper you go, the older the water. Typically the water in the bore-wells of Hyderabad is 6000 years old. It took 6000 years for that water to accumulate. What happens when we dry them out? Guess! So, what is happening now? Urban lakes that served urban water needs have been reclaimed. Cities are drawing water from rivers and irrigation reservoirs. As water table sinks lower and lower, farmers need more electricity to draw water from their wells because the wells have gotten deeper. The local ponds have dried up. All this while, we want more of rice and meat and other water heavy foods on our tables because we can afford it. Yes there are solutions, they are hard. Water is just one challenge as I had written above: soil, seeds and market are the other challenges. If we take a good long view of these four together, solutions emerge. Many are already working on these solutions, we will explore these in the next few posts. Rice, being such a staple Indian diet has so many variations one can think of. Just add a few veggies to it and it becomes a pulao, a biryani, khichdi, etc..the list can go on. A quick preparation is always welcome when we don’t have too many options. Two capsicums were literally suffering to be let out of my refrigerator for almost a week. I was tired of making capsicum sambar or using capsicum in my North Indian dishes; the idea of making a simple recipe with capsicum took over. 1. Heat oil in a kadai, add jeera and let it crackle, now add grated ginger,green chilli and curry leaves. 2. Once these turn a little brown, add the capsicum and saute till the capsicum turns soft. Add little salt so the capsicum does not taste unsalted when the rice is added. 3. Strain water from the rice, and add it to the fried capsicum, add ghee and saute for about 2 minutes. 4. Now add water and required salt, cover the kadai completely and let the rice cook for atleast 10 minutes. 5. Check to see if the rice is cooked and there is no water left in the kadai. If you find the rice still a little uncooked, you can add some more water accordingly and cook. 6. Heat ghee in a seasoning spoon and add cashews. When the cashews turn a little brown, add it to the cooked rice. The rice is done when you get a very nice aroma of capsicum mixed with ghee! You can serve this rice with a bowl of Raita and some papads. This is a very quick recipe and can be made when you are bored and have nothing more interesting to cook at home. Happiness they say is your last exam paper! March is the month for exams for most students in India. Nearly one and a half crore students are appearing for board exams in India this year after a gap of seven years. It is a highly stressful time. Revisions, portion, tears, meltdowns, night outs, burn outs – conversations revolve words like these in most homes. Parents are busy helping their children stay motivated and confident. 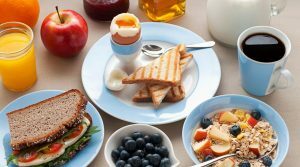 We all know that what you eat can affect your mood, alter stress levels and promote calmness. We tend to go on food binges under pressure and students are no different. Under the influence of examination stress there will be significant increase in food intake, and a tendency for high fat and sugary snacks. This can be counter-productive as unhealthy meals can add to stress levels. March is the month when the temperatures begin to rise in our country. This is good for bacterial growth and so the chances of getting an infection are very high. It is also the time when measles and chicken pox are rampant. To begin with give only fresh, homemade food to your children. Avoid all food from outside to safeguard them from any stomach bug. Water should be fresh and filtered. Don’t make any fried food items as these tend to make the stomach heavy. Avoid food that will give a sore throat and goes without saying, no carbonated drinks and ice cream please. Add a fistful of nuts, plenty of fruits and fruit juices to the diet to provide extra energy and keep them active. Tea and coffee can be had in moderation. A glass of milk in the morning and at bedtime will be good. This will give good sleep at night. This is as far as physical health is concerned. To make sure that children are mentally composed and not having panic attacks due to exam fears, help them maintain a proper study routine. Give tips on how to revise and write the exam. Keep them off television, Internet and social media as far as possible as they can take the mind away from studies. For rest and relaxation they can play board games or any light sport. Music is also a great stress buster. Yoga helps improve concentration, apart from helping relax the muscles. If your child is going for tuitions or combined studies along with friends, make sure he/she is not coming under peer pressure as it can be detrimental to his performance or hit his self confidence. Research has shown that 30% students going for board exams get into substance abuse (cigarettes, alcohol and even drugs) due to the stress. Keep the house well ventilated. Put your essential oil burner to good use now. Lavender, rose, ylang ylang and vetiver oils give out wonderfully soothing aromas to calm the mind. Most important, be there for your child as a friend and guide. This is the time they need you the most to help them do their best. Daana brings you wholesome, organic cereals and pulses at the click of a button. Place your order here.